Celebrate the Rhythm of Life: Get Your Rhythm On! As September rolls in, so does the need or maybe urge to bring form to our lives. The crisp dry air lifts the murky humid fog of summer and helps bring clarity to our minds, enthusiasm in our hearts and energy to our limbs. This, my friends, is the time to sink into a home rhythm that works for you. Each month I teach an eCourse to help you feel more confident as a parent. September's eCourse Your Way to Rhythm is devoted to helping you establish and maintain a harmonious home rhythm that suits the particular needs of your family. This popular online course, developed in 2012 by me will guide, nourish and support you each step of the way to develop rhythm from the inside out - for you to become confident within in establishing and maintaining a rhythm that supports your family. You'll be supported every single day through the month of September in Your Way to Rhythm. With Daily Support in the course through notes, recordings, videos and exercises to help you get your rhythm on. With Weekly Group Mentoring Calls for support, inspiration and answers to your questions. Ongoing. At the end of the course, you'll be invited to join a Facebook Community for class members that focuses exclusively on healthy home rhythms where you can check in anytime for support with your home rhythm and remain connected to others on the same path. I've been supporting parents, teachers and child caregivers in establishing and maintaining strong and healthy rhythms for decades. This course is full of new material and the best of material from past courses. I hope you'll join me for the month of September. 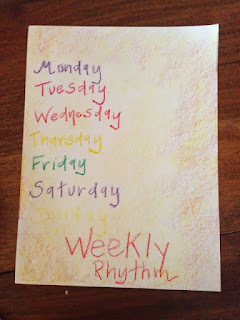 Lisa’s eCourse on Rhythm helped me see how simple rhythm can be. Her support through the month helped me make positive changes and stick with them. Our family life is calmer and I feel more confident, present (and patient) with my children. This is a super helpful course, thank you Lisa! There’s so much I want to do with my children now when they are young. Lisa’s Rhythm class helped me clarify what matters most and let go of the rest. The group experience over the course of a month helped me make changes. Our days are not all harmony and rainbows, but they are filled with more reverence and activities that I've been wanting in our days. I took this course (Rhythm) as a last ditch effort thinking it wouldn’t really help. Surprise ~ surprise, I found myself making small changes through the month. The momentum of the class with a community helped me lots. Lisa's guidance is gentle and full of wisdom. Join now to receive the support you need to feel confident in establishing and maintaining a strong rhythm in your home. It's Rhythm from the Inside Out! Your timing is perfect, this is exactly what we need after a full summer of late nights, sleeping in and loads of loafing around in the sun. Thank you for offering this now!